Aubrey Allen Moore, 91, of Camden, formerly of Arkadelphia joined our Heavenly Father on Monday, February 26, 2018 at his home. Aubrey was born September 25, 1926 in Corning, Arkansas the son of Lessie Lewis and Bertha Charlotte Moore. 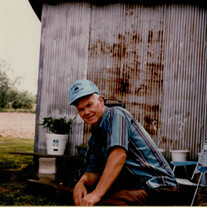 He was preceded in death by his parents, wife, Alma Jean; son, Billy Allen Moore Sr.; grandson, Jamie Allen Sharp; brothers, William Moore, Delmer Moore; sister, Doris Armstrong; and son-in-law, Mike Dempster. He is survived by loving daughters, Diane Melton (Phillip) of Donaldson, Arkansas; Maryetta Dempster (Evin) of Camden, Arkansas; daughter-in-law, Sharon Moore of New Orleans, Louisiana; eight grandchildren, sixteen great-grandchildren, one great-great grandchild, numerous nieces and nephews, a host of friends, a special "son" Alton Lynn Campbell of Tampa, Florida and his most beloved pet and very best friend, Hannah. To his grandchildren and great-grandchildren he was affectionately known as "Papaw". Aubrey Moore was born a farmer and as a young man worked the family farm until called to service during the Second World War, where he served in the United States Navy. During his service he saw duty in the Asian-Pacific Theater, assigned to the Navy's Amphibious Forces aboard the USS LST 221. He was awarded the World War II Victory Medal, the American Campaign Medal and the Asian Pacific Campaign Medal while on active duty. Following his enlistment, he returned to Corning and the life of farming that he knew and enjoyed all too well. In 1951, he married Alma Jean Kirby and together they would spend the next 60 years until her death in 2011. During that time they relocated and made Arkadelphia their home. Aubrey and Alma operated Moore's Produce Stand in the Joan Community and Gurdon area for a number of years following their retirement. It was through the operation of that roadside stand that their love and compassion for helping others revealed itself as they exemplified the "cheerful giver" who consistently and without condition provided produce at no charge to those who simply could not pay. Aubrey was a Christian of Baptist denomination. He was a quiet, caring man, who epitomized the perception of "country" and possessed a love for country music, especially when sung by his brother, Delmer, Aubrey was a gentle soul who will be missed by family and all who knew him. Service will be at 2:00 PM Friday, March 2nd at Ruggles-Wilcox Funeral Home with Bro. Ellis Jones officiating. Burial will be in Rest Haven Memorial Gardens. Visitation will be 6-8 PM Thursday at the funeral home. Memorials may be made to Ouachita County Hospice Center 726 California, Camden, AR. 71701 or to Kindred at Home 142 West Washington Camden, AR. 71701.